Flagella are the complex filamentous cytoplasmic structure protruding through cell wall. These are unbranched, long, thread like structures, mostly composed of the protein flagellin, intricately embedded in the cell envelope. They are about 12-30 nm in diameter and 5-16 µm in length. They are responsible for the bacterial motility. Motility plays an important role in survival and the ability of certain bacteria to cause disease. Each flagellum consists of three distinct parts- Filament, Hook and Basal Body. The filament lies external to the cell. Hook is embedded in the cell envelope. Basal Body is attached to the cytoplasmic membrane by ring-like structures. For cells anchored in a tissue, like the epithelial cells lining our air passages, this moves liquid over the surface of the cell (e.g., driving particle-laden mucus toward the throat). A wet mount technique for staining bacterial flagella is simple and is useful when the number and arrangement of flagella are critical in identifying species of motile bacteria. Grow the organisms to be stained at room temperature on blood agar for 16 to 24 hours. Add a small drop of water to a microscope slide. Touch the loopful of water to the colony margin briefly (this allows motile cells to swim into the droplet of water). Touch the loopful of motile cells to the drop of water on the slide. Cover the faintly turbid drop of water on the slide with a cover slip. A proper wet mount has barely enough liquid to fill the space under a cover slip. Small air spaces around the edge are preferable. Examine the slide immediately under 40x for motile cells. If motile cells are seen, leave the slide at room temperature for 5 to 10 minutes. Apply 2 drops of RYU flagella stain gently on the edge of the cover slip. The stain will flow by capillary action and mix with the cell suspension. After 5 to 10 minutes at room temperature, examine the cells for flagella. Cells with flagella may be observed at 100x. Could you kindly list all possible flagellated bacteria which could cause a postive IgG or IgM 41 antibody response? Thank you! can you please tell me the gene name which responsible for the formation of monotrichous, lophotricous, peritrichous and amphitrichous? 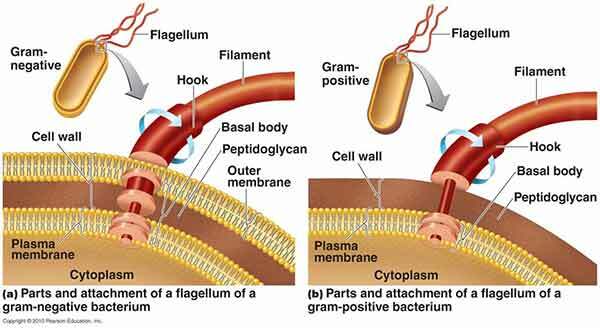 Nice basic information but it is not clearly mentioned the difference of Gram Positive and Gram Negative bacterial Flagellum or Flagella.